It's Harvest time at Great Frogs! We wanted to take you on a visual tour of what we've been hard at work doing, creating the next batch of great wines for you. As a matter of fact, we've been so hard at work that we're living in our Airstream until the harvest is over! There's a lot to oversee so it's just easier to stay on property to make sure that everything gets done on schedule. We started the harvest at the beginning of August. Our Harvest typically lasts between 4-6 weeks. We hand pick all of our grapes. Grapes that come from our Harness Creek and Choptank River vines are what make up our Estate wines. 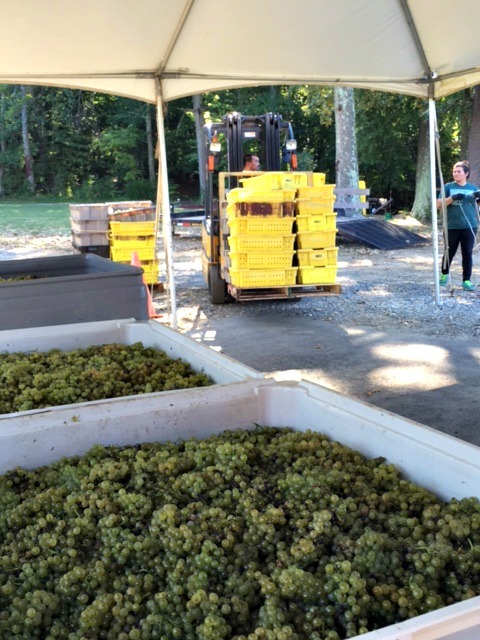 Grapes from other Maryland growers are what you're drinking in our Capital Series. We pick grapes by varietal because each varietal is ripe at different times. Grape picking at Harness Creek wrapped up on September 16th. Choptank Rivers was a day later. After the grapes are picked, we put them in a machine called the crusher destemmer. This machine takes the grapes off the stem and crushes the berries, chopping them in half so that juice comes out of them. The fermentation process varies for white and red wines. For red wines, we start fermentation on the skin. The skins on red grapes are different than that on white grapes. They're more like a shell. The fermentation process for whites lasts about a week or two longer. Once fermentation is complete, the grapes are pressed. For white wines, we remove the skins immediately so that when we press, we only have the juice. We start the fermentation process very quickly to protect the juice from oxidizing. Did you know that white wines have more sulfites in them so that they can stay white? Otherwise the juice will turn brown. The process differs slightly for our Rosé. Once we pick the grapes, we let the fruit sit on the skin for 12-24 hours, and then we press it. The fermentation process will continue until the end of October. Fermentation naturally produces SO2, preserving wine from oxidization. This is why we have to start fermentation immediately, to protect the juice from oxidizing. Depending on the grape varietal, we use different yeast strains to ferment the fruit. Fermentation of whites takes about two weeks longer than it does for reds. For both white and red wines, when the grapes are pressed we get a wine that’s just finished. The liquid is cloudy. This is because the yeast hasn’t settled to the bottom. We place the wines in a tank to let it settle. When we have wine in the vessel, we let the sediment go to the bottom and skim the wine off the top. This process is called racking. We run through this process 2-3 more times. The remaining waste at the bottom is called lees. This is made up of yeast, yeast nutrients, and any kind of sediments from the grapes. Once the wine has gone through fermentation and racking, it's time to age it. For our Estate wines, we age in oak. For our Capital series we age in steel. For the wines aged in steel, you can taste this year's harvest in the Spring. For the wines aged in oak, it will be 1-2 years before you'll have a chance to experience the 2016 harvest. You can always tell when the grapes were harvested by checking out the year on our labels. That’s what we've been up to in the lab....making the best Annapolis wine product for you. It's hard work but it's a labor of love.